Eva plays Elle, a charming, intelligent and intuitive young woman who befriends Delphine and shows a deep understanding of her struggles better than anyone. The film is based on the critically acclaimed novel D’après une histoire vraie by Delphine de Vigan. The book was released in 2015 in France and has won the Prix Renaudot and Goncourt des Lyceens. The English translated version of the book will be released on May 9, 2017. The film has an official running time of 1 hour and 40 minutes. The film was shot in the Perche region (in the village of Chapelle-Royale and in the municipality of Altars-Villevillon/Les Autels Villevillon, Centre Val de Loire, France) and in Paris, France (Studios de Bry-sur-Marne). Production started on November 7, 2016 in Chapelle-Royale. This film is Eva’s second French language film. Her first was Jean-Paul Salomé’s Arsène Lupin (2004) with Romain Duris. The film marks Eva’s return to French cinema after exclusively doing English-language films and television for the last 13 years. This is the fourth collaboration between husband and wife Roman Polanski and Emmanuelle Seigner. They previously worked together in Frantic (1988), Bitter Moon (1992), The Ninth Gate (1999) and Venus in Fur (2013). This film marks the return of Roman Polanski to filmmaking since his 2013 drama Venus in Fur. This film marks the first collaboration between award winning directors Roman Polanski (Repulsion , Rosemary’s Baby , Chinatown , The Pianist ) and Olivier Assayas (Clouds of Sils Maria , Personal Shopper ). Polanski will be directing the film and co-writing the screenplay with Assayas. This film is Roman Polanski’s sixth feature film collaboration with cinematographer Paweł Edelman. They previously collaborated on The Pianist (2002), Oliver Twist (2005), The Ghost Writer (2010), Carnage (2011), Venus in Fur (2013). The film has an estimated budget of €10,000,000. The film keeps its original book title D’après une histoire vraie while Based on a True Story serves as its English title for its worldwide release and it’s Russian title is Основано на реальных событиях. The film premiered and screened Out of Competition (Hors Compétition) during the 70th annual Cannes Film Festival, on May 27, 2017 at the Grand Théâtre Lumière. This film is Roman Polanski’s seventh film to be shown at the Cannes Film Festival. Emmanuelle Seigner suggested the book to her husband Roman Polanski to read after seeing that the book is reminiscent of Polanski’s older film work. 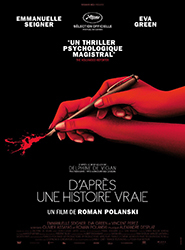 Polanski was was very impressed by Delphine de Vigan’s writing that he decided for it to be his next film project. Roman Polanski contacted fellow director Olivier Assayas to co-write the film’s screenplay with him after being impressed by his body of work that deals with mirror personalities. Eva was Roman Polanski’s only choice to play the character Elle after being impressed by her performance as Ava Lord in Robert Rodriguez and Frank Miller’s Sin City: A DameTo Kill For (2014). Eva was already involved in the project even before it had a finished script. Delphine’s (Emmanuelle Seigner) notebooks show designs inspired by painter Edward Hopper. The film was shown at the 2017 Cannes Film Festival with a different ending compared to the theatrical release.